Are you confused by what your cholesterol levels really say about your health? Don't you wish someone could just spell it out in simple English and tell you what, if anything, you need to do to improve your heart and overall health? That's precisely what Cholesterol Clarity is designed to do. 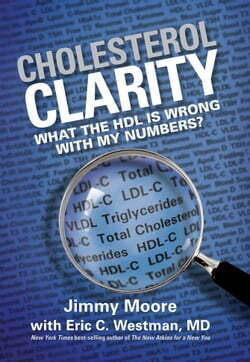 Jimmy... read more Moore, a prolific and highly respected health blogger and podcaster, interviewed 28 of the world's top health experts from various fields to give you the complete lowdown on cholesterol. He and his co-author, family practitioner and researcher Dr. Eric Westman, have broken down this critical information for you to know what is most important and what is not.